This page is a translated version of the page Tabo and the translation is 100% complete. Tabo is the second trademark used by Stiassi e Tantini for fountain pen production. It was registered in 1940, so we consider this year the start of production for this brand. There no known evidences for a different production start date, nor the reason for changing trademark from The Scotland. The Tabo branded pens, as for the previous The Scotland ones produced by the same company are high-quality and some model are made by very nice semi-transparent celluloid. Tabo pens seems to have a good success, because they are less rare than The Scotland but still are highly sought by collectors. The Tabo brand fountain pens production is rather late and goes back to the late '30s. The activities of Stiassi e Tantini results to be closed in 1939, but the two members founded the previous year a new company named "S.I.S.A. ", acromym of Società Italiana Stilografiche e Affini (meaning Italian Company Fountain Pens and Related), that was remaned in 1940 (?) as "F.I.S.A. ", acronym of Fabbrica Italiana Stilografiche e Affini (meaning Italian Factory Fountain Pens and Related) who was the company giving birth to the production of Tabo branded pens, another acronym used as an abbreviation for the term Tantini - Bologna. 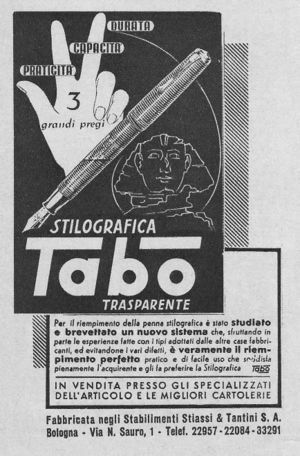 In later years the company name was changed again in Stiassi e Tantini S. A., wording that appears in the first Tabo pen advertising dating from the early '40s. The F.I.S.A. is however reported as a fountain pen company in the general industry directory of 1956. The Tabo series of late 30's were produced in different versions depending on the filling systems as there were button filler models, called Mentis, and depression filler models, similar to the Vacumatic, called Trasparente, as well as models with the more ordinary lever filler with a faceted body, similar to the Omas Extra, identified by the number 1931. Finally there were also safety models, made in hard rubber or with metal overlay, very similar to those found in the Montegrappa production, named with a four digits code number. In addition to previous Tabo marked models, which were the first tier production that has nothing to envy in terms of quality compared to pens produced by the other major Italian manufacturers, the company also made second-tier fountain pens, at a lower price, using a series of sub-brands such as StyBy, Stibi, EsseTibi, S.T.B..
After World War II the company faced an increased competition by the impact of the molded plastic introduction in fountain pens production, whose circulation was rapidly increasing in Europe. All series were reviewed by using the piston filler, then was introduced the Vertex line, a covered nib pen (later replaced by Tabo V) and the two lines S and CO to indicate respectively the models with hooded nib and the models with metal cap, (CO is the acronym of Cappuccio Oro, meaning gold cap). The end of Tabo production is considered coincident with the shutting down of Stiassi e Tantini, that closed its activities in 1948 but their pen were probably produced for some more time. Because their high quality, that has nothing to envy to that of the more famous Italian brands, Tabo pens are hoghly sought by collectors. ↑ see the extracts published in this discussion.